An introduction to the life of MasterCard Foundation Scholars at Ashesi University. Lloyd Teta and Denver Chikokonya are two Zimbabwean students under the MasterCard Foundation Scholarship at Ashesi University, majoring in Mechanical Engineering and Computer Engineering respectively. In their freshmen year, they got introduced to an entrepreneurship course entitled Fundamentals of Design and Entrepreneurship (FDE) where they got the chance to start a venture called African Transformers which over one year escalated into a feasible organization. Having seized the opportunity of commencing this organization on Ashesi grounds, Lloyd and Denver decided to join the Millennium Fellowship Class of 2018. Millennium Fellowship is a one year leadership program brought by Millennium Campus Network in collaboration with the United Nations Academic Impact. This program comprises of exceptional students globally, who show an excellent social drive to better their communities. Upon joining Millennium Fellowship, in September, 2018, they applied for and won the Millennium Oceans Prize, which was a whopping amount of $5000, to implement a concrete campaign which would spark a change towards the conservation of oceans and freshwater systems in Ghana. The Millennium Oceans Prize is awarded to student leaders who are passionate about conserving, protecting, and sustainably using ocean, and marine water & life. This award is sponsored by Millennium Oceans together with the Remmer Family Foundation. 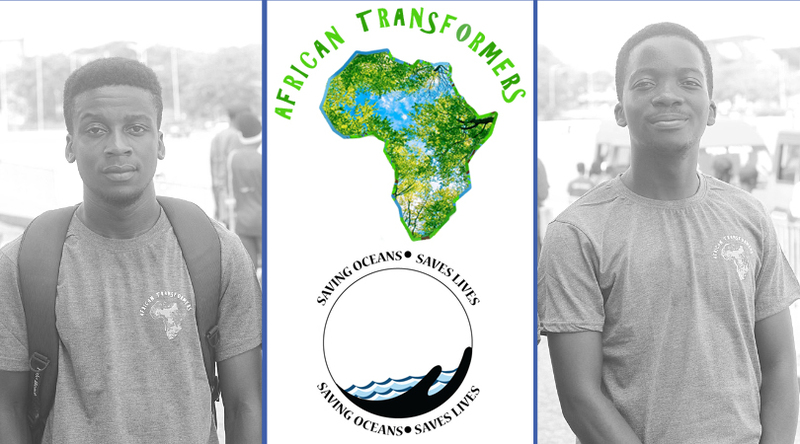 The prize will fund African Transformers in their campaign towards saving the ocean in Ghana. African Transformers is a social venture co-founded by Lloyd Teta and Denver Chikokonya. It aims at reducing plastic waste and creating awareness about the need to protect the environment by creatively reusing (recycling) plastic waste. African Transformers’ vision is to create an environment where people are aware of the actions that may potentially (readily) harm the environment. They work towards achieving a world whereby people engage in environmental actions that are environmentally friendly in order to sustain life both on land and in the ocean. Their mission is to reduce plastic waste and eradicate improper plastic waste disposal across Accra and the Gulf of Guinea Ocean shores which is near Accra in Ghana, reason being that inland waste ends up being washed away into the ocean. They also aim at creating environmental awareness to the Ghanaian youth on the consequences of littering. They do so by holding clean up sessions, hence spreading the word on littering. Their second goal is that by May, 2019, 50 bins would have been placed around Ghana, collecting a minimum of 800 kilograms of waste and have more than 250 recycled products produced such as vases and cases made from plastic waste. Easy and Cheap Recycling is about reusing plastic waste to make creative art and utensils, and teaching Ghanaians basic recycling. This involves holding school workshops and teaching students about environmental sustainability as well as organising environmental related competitions in schools across Accra as a way to encourage students to come up with innovative ideas that would eradicate ocean pollution. Organizing beach and inland clean up campaigns. Collecting plastic waste to sell to recycling companies in Ghana. Raising awareness to more than 250 people in Accra, Ghana. Successfully organized a massive beach clean-up campaign whereby around seventy-five volunteers attended.